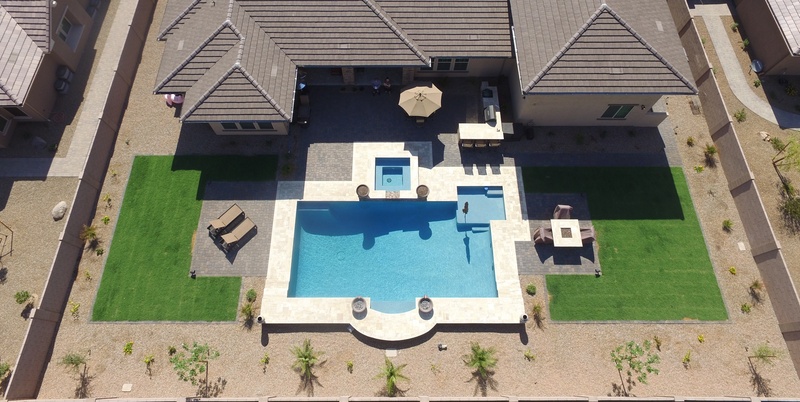 THE Neier FAMILY OF gilbert, ARIZONA PARTNERED WITH PRESIDENTIAL TO BUILD THEIR DREAM BACKYARD, AND WERE NICE ENOUGH TO SHARE PICTURES (From their drone!) AND DETAILS ABOUT THEIR PROJECT, ALONG WITH ADVICE FOR THOSE OF YOU WHO MAY BE LOOKING TO BUILD A SWIMMING POOL. In deciding to build a new house, the Neier family realized it only made sense to build a pool at the same time. The ability to work with the home builder and Presidential Pools made it easy to schedule and finalize the terms without having to finance multiple times. What prompted you to build a pool? We've had a pool/spa at all of our Arizona homes. They're perfect for entertaining family and friends plus swimming is great exercise. What features were most important to you in designing your pool? There were several features that we discussed with Kip [their dedicated designer]. We wanted an attached spa, water features and fire pots. 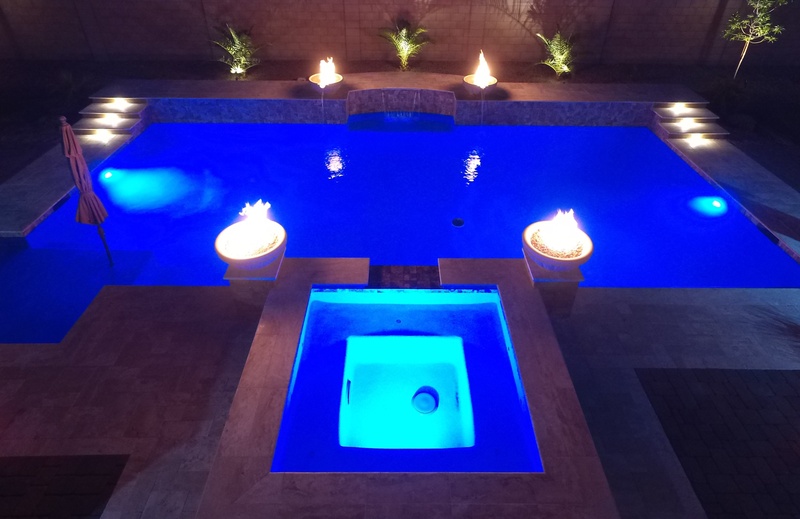 Kip did a great job designing these features into our entire pool/backyard design. What do you like most about your pool now? We like the entire pool but the fire pots really set it off at night. What advice would you offer to those just starting the pool building process? First, take some time and look around for the features that you like. Then discuss those items with someone at Presidential Pools. They'll put together a plan and proposal that fits your budget. 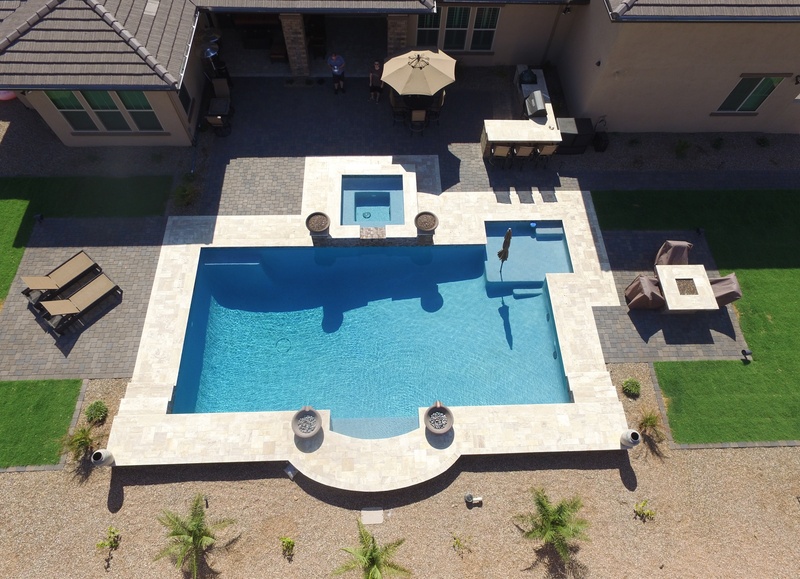 In the Phoenix Valley and Tucson metro area, we provide custom pool design and building services, spas & hot tubs, outdoor living furniture and accessories, backyard hardscaping and more.